Written in 1972 by longtime Ojai resident Howard Bald. 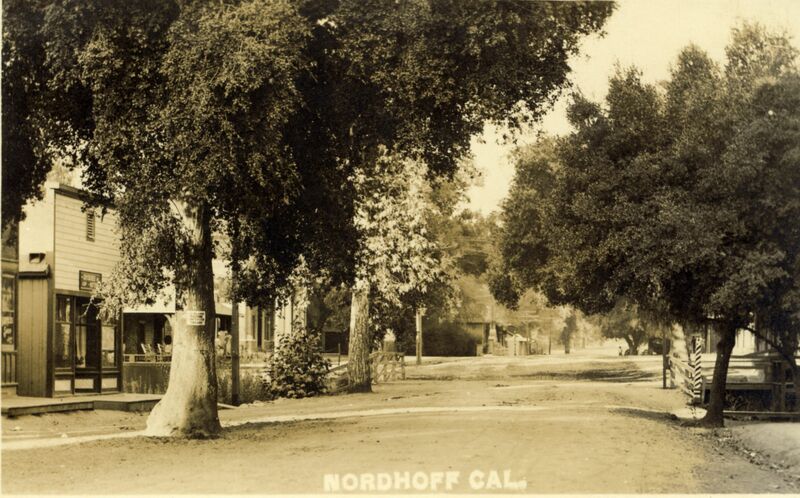 Nordhoff (now Ojai) has generally been described as a quiet, peaceful little place, and generally it was. 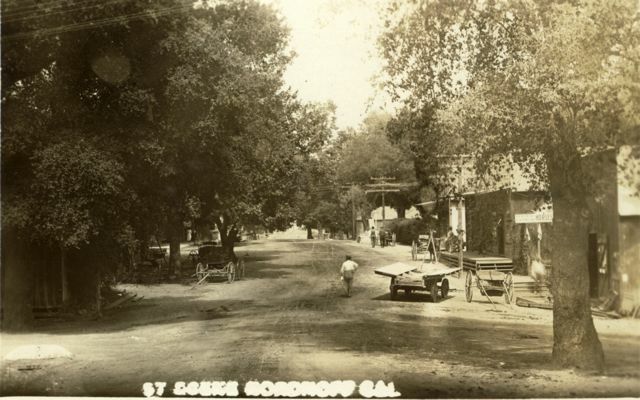 Several oak trees strung along Main Street from Tom Clark’s livery stable [Ojai Village Pharmacy] to Schroff’s harness shop [Ojai Cleaners] furnished the only shade, for there was no arcade until 1917. There were three gaps in the row of buildings on the north side of Main Street. One was between Lagomarsino’s saloon and Archie McDonald’s blacksmith shop at the east end of the business block [the Hub], and Barrow’s hardware store stood alone. There was an alley on both the east and west side of that building, which I think was the site of the present hardware store [Rains]. Corner of Montgomery and Main looking west. West of that alley was Bray’s plumbing shop, and from there on to Signal street was the livery stable with its buggy sheds, corrals, and hay sheds. West of Signal on the site of the Oaks Hotel stood a small, whitewashed, clapboard building where Chet Cagnacci was born at the turn of the century and later, I believe, Tommie Clark. Corner of Signal and Main, looking east. Across the street about the site of Van Dyke’s Travel Agency [Library Book Store] stood Dave Raddick’s residence, then easterly a break then the meat market [The Jester]. On the southwest corner of Signal and Main was The Ojai newspaper printing office where the theater now stands and easterly across the street, where the present post office is located, was Charley Gibson’s blacksmith shop. There was a gap between the blacksmith shop and Lauch Orton’s plumbing shop, the barber shop and post office. Through that gap could be seen the Berry Villa, which is now the Post office employee parking place. A little distance east of the post office, briefly, stood C.B. Stevens little grocery store, then the entrance and exit to the Ojai Inn, which is now our city park. A leaky, redwood horse trough and a hitch rail extended onto the barranca. It was always shady, and teams of horses and buggies were customarily tied there while the out of town folks did their shopping. I once had a Plymouth Rock hen who would bring her brood through the alley between the saloon and blacksmith shop to scratch around where the horses were tied. Sometimes she would miscalculate and be overtaken by darkness, so hen and chicks would simply fly up on a vacant spot on the hitch rail and settle down for the night. Our stable and chicken coop was just back of Dr. Hirsch’s office [Dr. Phelps], and more than once at about bedtime, I would carry them back to their own nest. horses while attending services at the Presbyterian church, which then stood where [Jersey Mike’s] parking lot now is. 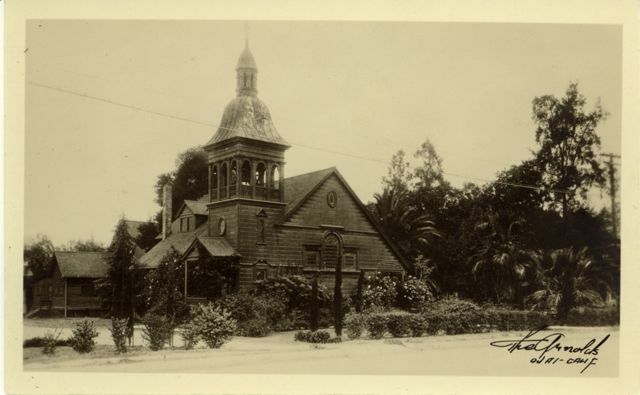 That building is now the Nazarene Church [Byron Katie’s headquarters] on N. Montgomery and Aliso. 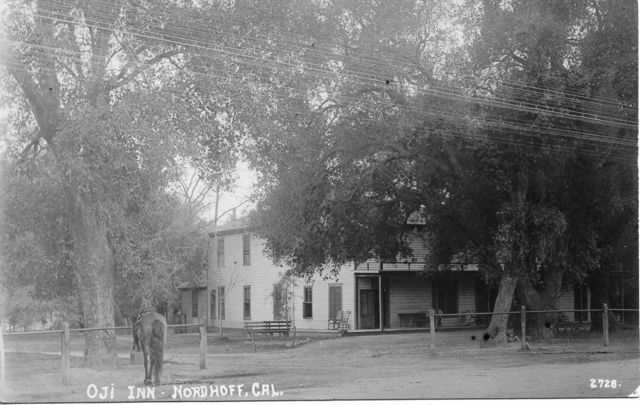 I could go on and on and on with details of the village of Nordhoff at the turn of the century, but I fear that would become too boring, so I will get on with some of my memories of the activities of the time. I love seeing this old stuff – my father kept clippings of Howard Bald’s newspaper articles. The building that was Van Dyke’s Travel Agency was first the home of the Ojai Valley Company- one side Libbey’s Real Estate office, the other Libbey’s Ojai Mutual Water Company. Craig surely recalls the alley next to Hickey Bros (now Rains) because his dear father worked in Nendel’s jewelry store at least until 1961. I am so excited to see my G G Grandfather’s name in this part. His name was David Raddick and he owned the Pool Hall and Cigar Shop. Would anyone know anything about him or his family? My husband and I will be visiting Ojai in a couple of months and I wish I could get the exact place where his pool hall was. I know it was destroyed by the fire, but I noticed in the article above they mentioned his residence was where the Van Dykes Travel used to be. Would I still be able to find the place? Doing Genealogy on his part of the family.